Who was Elmer Pirson? I wish I knew. In an old box of papers I came across a neat piece of paper obscured by a sticker. I left it for a while but when making a keep/toss pile I saw it again. I had never thought of steaming old paper. It has to the quickest way to its destruction. Thinking that it was going to be tossed what difference would it make if I failed? I thought the illustration was incredibly vibrant for its age. 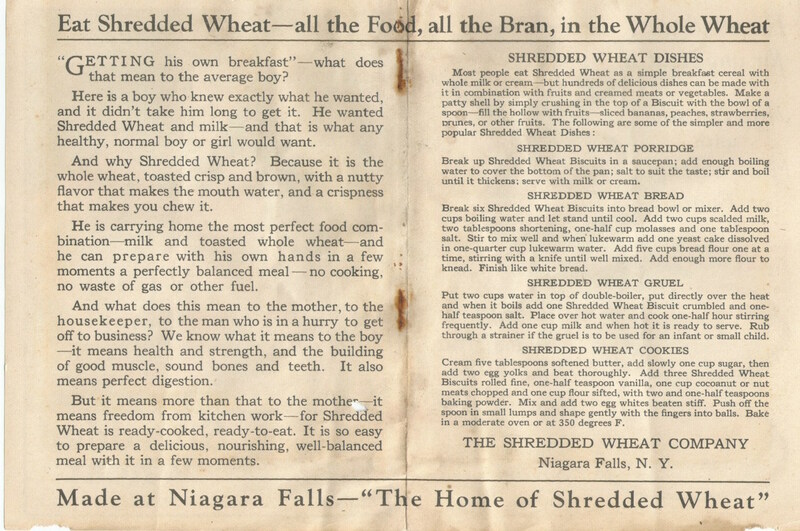 The interior was intact and seeing the recipes like this one…I couldn’t resist. The steaming experiment was a success, although I regret not offering a "before" image. You can see from the fading and the white marks where it was doing the worst damage. Now has become one of my favorites, mainly for the illustrator. Elmer Pirson was born in 1888, just about 5 years after Shredded Wheat was invented. Henry Perky was only trying to invent a machine to make a cereal biscuit and sell the invention. The baked wheat biscuit trued out to be popular and he began expanding it’s production. Moving first to Worcester MA and then to Niagara Falls, NY he also began making Tricots in 1902. 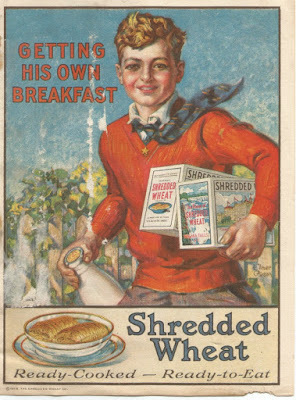 The company When from being called the Cereal Machine company to the Shredded Wheat company. 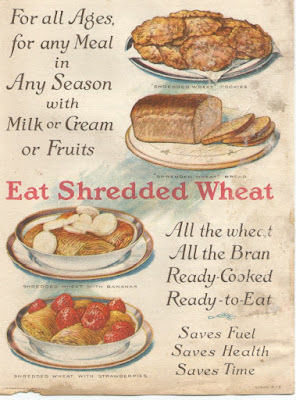 What makes my find so interesting is that it is the last year that The Shredded Wheat Company existed before being sold to The National Biscuit Co. in 1928. For more on the Shredded Wheat story, visit Topher's site here. My love of illustration, film and old paper came together in this discovery from a box lot of papers purchased at an estate sale. Advance warning: I can't reveal the whole story of this film because my research has hit a few dead ends. I can share this promotional program which may have accompanied the films release in Germany. I had some fun trying to translate the title. I did initially find out that this was a Russian film released in Germany, but just trying to get an americanized title out of those 3 words was a challenge. Google translate, although an awesome app had me believing this film was called "My Beloved Canteen" Then it seemed the title was "My beloved Man." I am going with "My Dear Fellow" which is a loose interpretation according to a thin IMDB listing. The were both so young...or words to that effect. If you can add to this or the IMDB post, I think you would be doing society, and certainly me, a tremendous favor.